REquipment is a much-needed one-stop service for giving donated DME a useful second life with people who need it. Through REquipment, adults and children with disabilities and seniors statewide can search our online inventory of refurbished power and manual wheelchairs, scooters, shower chairs and more to assist them to live more independently and safer in their communities. REquipment devices are provided at no charge and without the hassles of medical insurance thanks to generous equipment donors. The results? In FY ’17, REquipment redistributed close to 860 high quality pieces of medical equipment valued at more than $1.8 million dollars. REquipment is currently supported by a collaboration of public and private funding from the Massachusetts Rehabilitation Commission's (MRC) MassMATCH program, the Massachusetts Department of Developmental Disabilities (DDS), the Massachusetts Department of Public Health (DPH) as well as private grants through The Christopher and Dana Reeve Foundation. REquipment is pleased to partner with Stavros Center for Independent Living and United Cerebral Palsy of Berkshire County to provide reuse DME to residents of western Massachusetts. Interested in supporting our mission? 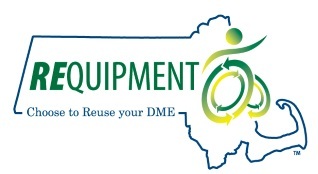 Potential reuse partners, donors and funders should contact Jennifer Smith, REquipment Program Director at (800) 261-9841 or email info@dmereuse.org. Stay in touch with REquipment! Like us on Facebook and subscribe to our email newsletter.